235 Beacon is located on the south side of Beacon, between Clarendon and Dartmouth, with 233 Beacon to the east and 237 Beacon to the west. 235 Beacon was built ca. 1870-1871 by Bourn & Leavitt, carpenters, for speculative sale. Robert Tower Bourn (Bourne) and William Leavitt both lived in Cambridge. 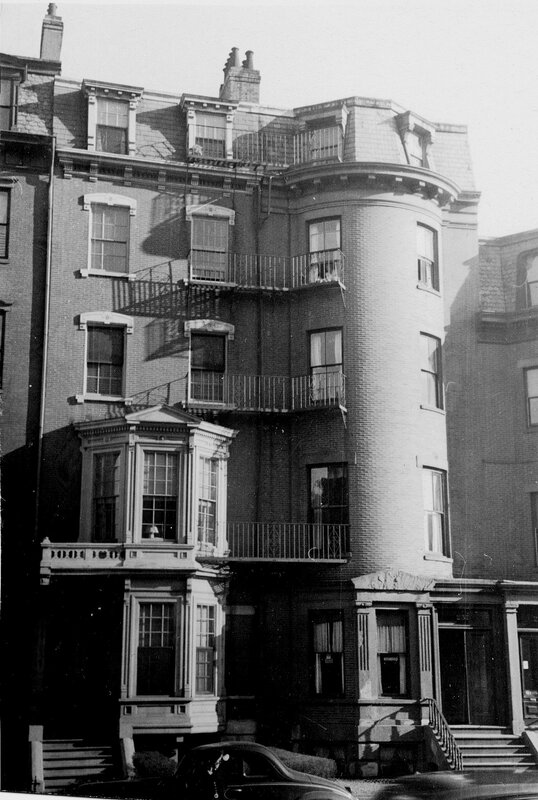 They purchased the land for 235 Beacon from the Commonwealth of Massachusetts on April 1, 1871, after the house had been built (on the same day they acquired the land, Robert Bourn and William Leavitt mortgaged the “land or flats with the buildings thereon” to Nathaniel Silsbee), probably built under an earlier purchase and sale agreement with the Commonwealth. 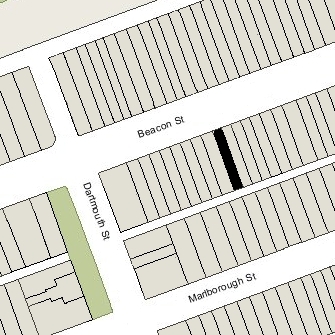 237 Beacon was similarly built before the land was conveyed by the Commonwealth, also on April 1, 1871. It was the home of Nathaniel Silsbee and may have been built by Bourn & Leavitt for him. Click here for an index to the deeds for 235 Beacon. By 1874, 235 Beacon was the home of Charles Gustavus Lundell, a dealer in Swedish iron, and his wife, Elizabeth (Atkins) Lundell. In 1873, they had lived at the Hotel Vendôme. They continued to live at 235 Beacon in 1875. By 1877, they were living at the Hotel Vendôme once again. By the 1878-1879 winter season, they were living at 239 Beacon. On October 13, 1875, 235 Beacon was purchased from Robert Bourn and William Leavitt by Lucy Josephine (Brown) Parker, the wife of Henry G. Parker. They previously had lived with her parents, William and Lucy (Church) Brown, at 4 Commonwealth. Henry Parker was editor and publisher of the Saturday Evening Gazette. They continued to live at 235 Beacon in 1883. In October of 1883, they purchased 240 Commonwealth, where they moved soon thereafter. On April 15, 1884, 235 Beacon was acquired from Lucy Parker by Sarah C. (Iasigi) Dwight, the wife of Dr. Thomas Dwight. They previously had lived at 251 Beacon. They also maintained a home in Nahant. Dr. Dwight was a physician and was Parkman Professor of Anatomy at Harvard Medical School. Thomas Dwight died in September of 1911. Sarah Dwight continued to live at 235 Beacon until about 1925, when she moved to Brookline. On May 28, 1925, 235 Beacon was acquired from Sarah Dwight by Herbert A. Brooks. He was assistant manager of the Copley Plaza Hotel and purchased 235 Beacon as an investment. He lived in Somerville. In May of 1925, he applied for (and subsequently received) permission to extensively remodel the interior. The house remained a single family dwelling. During the 1925-1926 winter season, 235 Beacon was the home of Frances (Nevins) Williams, the wife of Joseph Mason Williams. 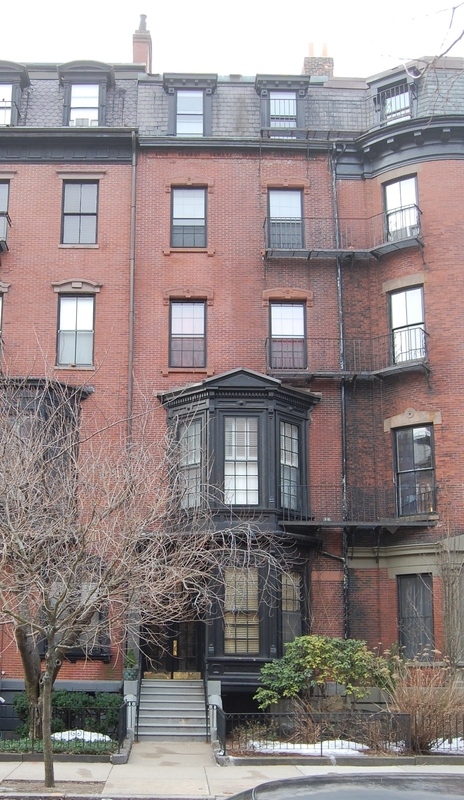 She also maintained a home in Brookline, which usually was her year-round residence, where she operated a lodging house. Her husband was an attorney in San Antonio, Texas, where he died in February of 1928. During the 1926-1927 winter season, 235 Beacon was the home of Mrs. Mabel E. Franklin, who operated it as a lodging house. She previously had lived in Provincetown. During the 1927-1928 winter season, 235 Beacon was the home of Ella J. (O’Connell) Good, the widow of Dr. John P. Good, and their twin daughters, Katherine and Julia P. Good. They also maintained a home in Hull. They previously had lived in Cambridge, where John Good had been a dentist and served as a member of the Massachusetts House of Representatives; he had died in July of 1925, the victim of an accidental drowning in the Charles River. On January 16, 1928, 235 Beacon was acquired from Herbert Brooks by Frank J. Brown. By the 1928-1929 winter season, 235 Beacon was the home of Walter Lorenzo Rolfe and his wife, Catherine Isabelle (O’Brien) Rolfe. Walter Rolfe was a piano teacher, composer, arranger, and music editor. He published more than 800 compositions. The Rolfes continued to live at 235 Beacon in 1932, but had moved to 90 Huntington by 1933. On March 3, 1933, the Whitinsville Savings Bank foreclosed on a mortgage given by Herbert Brooks which had been assumed by Frank Brown. The bank took possession of the property. On August 30, 1933, 235 Beacon was acquired from the Whitinsville Savings Bank by Ethel H. Anderson. The house was not listed in the 1933-1937 Blue Books, and was shown as vacant in the 1933-1937 City Directories. On March 31, 1934, the Whitinsville Savings Bank foreclosed on the mortgage given by Ethel Anderson at the time she acquired 235 Beacon, and once again took possession of the property. On December 3, 1936, 235 Beacon was acquired from the Whitinsville Savings Bank by Wallace Raymond Marden. He and his wife, Marjorie L. (Maclary) Marden, lived in Hingham. In November of 1936, prior to taking title to the property, he had applied for (and subsequently received) permission to convert the house from a single-family dwelling into ten apartments. On October 23, 1950, Wallace Marden transferred the property to himself as trustee of the Investment Realty Trust. On March 14, 1944, he appointed his brother-in-law, Richard David Maclary, as successor trustee. On August 11, 1955, Richard Maclary transferred 235 Beacon to himself as trustee of the United Realty Trust. The property subsequently changed hands, and on April 27, 1983, was acquired by John C. Clawson and Carl R. Franceschi, trustees of The Beacon Studio Trust. In June of 1983, they applied for (and subsequently received) permission to remodel the apartments, keeping the number at ten. On February 21, 1985, they converted the property into ten condominium units, the 235 Beacon Condominium.